WASHINGTON — President Donald Trump's criticism of the FBI and Justice Department will have long-term effects on the credibility of federal agents, former attorney general Eric Holder warned Wednesday. In some future trial "where a credibility determination has to be made between an FBI agent saying one thing and a defendant who's a witness saying something else," the president's comments "will raise doubts in the minds of people who listened to that FBI agent and what she says in a way that never existed before," he told reporters at a Christian Science Monitor breakfast in Washington. "The long-term negative collateral consequences are substantial, they're real, and I would hope the president would pull back." Trump said last year that Holder as attorney general protected President Barack Obama, adding, "I have great respect for that." Holder said Wednesday that it would be a good thing for Trump to treat the Justice Department the way Obama did, because the former president respected a wall between the White House and Justice Department. "There were things I did as attorney general, decisions I had to make, that were not communicated to him," Holder said. "My guess is there are more than a couple that he probably did not agree with." 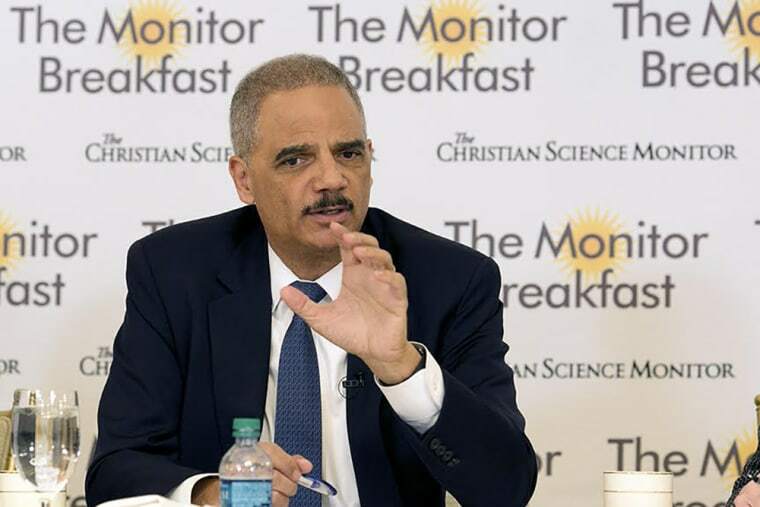 Even so, Holder said, he never heard anything from Obama criticizing one of his decisions. The former attorney general said he fears House Republicans may have chilled future intelligence sharing by revealing classified information about the application for an eavesdropping warrant against a Trump campaign adviser, Carter Page. As a result of the Republican memo, someone who wants to share information with the United States "may have to think, what does this mean? Is my identity going to be revealed?" Holder said. Holder was not involved in approving any of the four Foreign Intelligence Surveillance Court warrant applications that were the subject of the Republican memo, known as the Nunes memo, after the chairman of the House Intelligence Committee, Rep. Devin Nunes, R-Calif. Asked if Trump should agree to be interviewed by Robert Mueller's investigators, Holder said, "That's a determination he and his lawyers will have to make." The president could refuse by citing Fifth Amendment privilege, "which would be almost fatal for any other politician," Holder said. "But this president says he could shoot somebody on Fifth Avenue and not suffer any negative political consequences."